Welcome to our little corner of the big blue sky. We've flown for movies, military projects, search & rescue, television, and expeditions in 6 different countries. And now, we've stationed 3 of the world's most advanced Powered Hang Gliders (aka "Trikes") right here in Arizona - just for you. This is a first-class open-cockpit adventure that appeals to the person, or group, that desires more freedom than a hot air balloon ride, more exposure than a helicopter ride, but less adrenaline than skydiving... Our aircraft is similar to a large motorcycle in the sky - only without blind spots & drunk drivers! Your safe & charismatic instructor will guide you on a "low & slow" adventure through the dynamic terrain of the Sonoran Desert, skim the shallow bays of Lake Pleasant, spy on ancient ruins and soar over the high mesas with the perfect mix of thrill & relaxation - while leaving no impact on the eco-system! So, whip out your bucket list, slip into a heated flight suit, dawn a music-filled headset & climb into one of the safest & most advanced Trikes the world has ever seen. All clients get a demonstration of the aircraft and an opportunity to command the controls with your flight counting towards the 20 hours required for Sport Pilot Certification. We have flights in all price ranges whether you're looking for an adventure to remember the year by, a family or group event, join the sport, or even a multi-day Aerotrekking Expedition through Sedona, AZ to Moab, UT. By the way, here's note about the duration/minutes of flight - we're in no hurry to land if you're not. You'll always get more than you paid for - unless the sky gets bumpy & we're both ready to come down. "THE SCARDY CAT" (Duration: About 5 Minutes) Cost: FREE! Get the best of both low & high altitudes as we start by zipping along the nape of the earth on the Boomerang Route, then out to the Saguaro-scattered beaches & sandbars of Lake Pleasant where we'll cruise the shallows of the north shore, wave to the wild donkeys, javelinas & jeep tours! Then, we'll buzz up to the mesas at the base of the Bradshaw Mountains for an incredible opportunity to see inaccessible Native American ruins! On the way back to base, you can take the controls as we climb up to altitude for what the aircraft does best - GLIDE! We'll actually shut the engine down & glide to a smooth landing back at the hangar. You'll never look at the sky the same. Photo & video services available. Gift Certificates available for this experience. All flights are instructional in nature. As seen on TV! 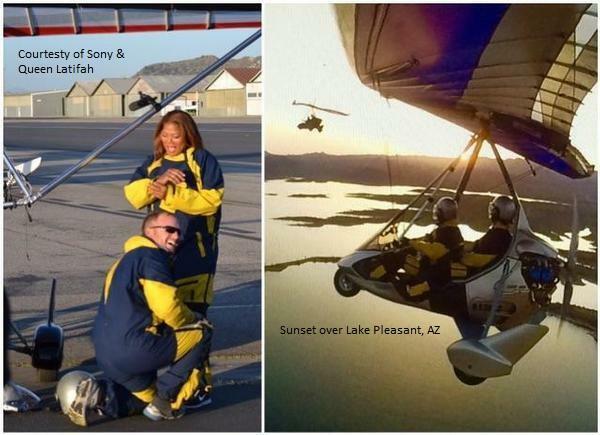 We've hosted this event for the Travel Channel, Arizona Highways, Discovery Channel and even an event for Queen Latifah. A really unique experience here in the desert, and it's the most bang for the buck. This is small private event during a morning or evening dedicated to you - or your small group. It takes about 2-3 hours or as conditions permit. You can come by yourself to truly explore the sport as an orientation, or bring the whole dang family/group for a bunch of short flights & socializing. This private event is excellent for a Date, Anniversary, Birthday, or even Family Bonding. During this time, the facility & aircraft are dedicated to you only. It's a truly unique experience in the perfect location for low, slow & safe flight with a certified instructor in a state-of-the-art Light Sport Aircraft. Or, just watch everybody else in your group. We've flown people from 6 years old to 100 and have flight suits, helmets & headsets to fit everyone & make great profile pictures on Facebook! Each flight will typically offer a cruise above the Sonoran Desert terrain, river beds & ridgelines while offering you one-on-one attention both on the ground and in the air. While safety is our #1 concern, the terrain & conditions frequently open opportunities to get down low (sometimes only a few feet off the ground) and see it all at about 45mph! It is fun to appreciate the ecosystem - everything up close - while leaving no tracks! Most of our flights finish with a trip up to about 3000 feet over the landing area to do what the aircraft does best - shut the engine off & glide to a smooth landing! Although considered an extreme sport, we have been recognized as one of the best safety records in the world. All of our fleet aircraft are equipped with a ballistic parachutes that can save the entire aircraft & crew. Absolutely all of our flights are instructional in nature depending on conditions & your desires. Our aircraft are fully equipped for instruction so that you can fly the aircraft from the passenger seat. Also included in your cost is a Membership Fee that makes you a member of our Flying Club! Photo & video services available. Gift Certificates available too. Email Us if you are interested in scheduling a Sky's The Limit event. If the line of climbers on Mt Everest looks like rush-hour in Los Angeles to you, or riding a BMW through South America sounds like a case of hemorrhoids, then a low-altitude AeroTrekking trip in a Trike just might be the adventure you're looking for this year. We're the only company actively delivering on these trips in the United States and we've been doing it for a decade. We have several routes in the US originating in either Washington or Arizona. Our most popular aerotrek is the Arizona/Utah excursion which starts in Scottsdale, AZ, winds through Sedona, AZ, the Grand Canyon, Lake Powell and into Moab, UT. Available from October - May. Our Washington/Idaho trip is available July - September and focuses on the Ice Age Floods Route from Hope, Idaho to Seaside, Oregon. Pending weather, we'll fly most mornings & evenings with mid-days left open to exploring & relaxing - yes, you'll need it. Accommodations include anything from camping on sandbars to hip historic hotels. Great food, beverages & expedition-quality gear are provided. Photo & Video services are included. Your instructor/guide will be fun, experienced & understands that this trip is about you & your celebration of life. Come prepared for a hands-on expedition where you are part of the team. Ground Support is provided. Most clients can actually fly the Trike by the 3rd day and can land it by the end of the trip. We count all hours toward certification of a Sport Pilot license. Gift Certificates available for this experience. Call for details. Email Us if you are interested in scheduling an Aerotrekking Excursion. We are conservative pilots/instructors and have one of the best safety records in the world. Our aircraft are typically 2 years old or newer, cost over $85,000 each, have certified 4-stroke engines, carbon fairings, nitrogen suspension, heated seats, full avionics systems, VHF communications, primary & secondary GPS systems, oxygen, life preservers, fire extinguishers AND are uniquely fitted with ballistic parachutes designed to save the entire aircraft & crew. Our planes are also gliders before they are anything else. They are capable of landing with less speed (35mph) & distance required (200 feet) than 97% of other aircraft. However, NO amount of diligence, maintenance & experience can eliminate ALL risk of injury or death. It can happen. We have no interest in hurting ourselves, nor our equipment & consequently not you either. But, YOU will be taking a risk both on the ground & above it. And, you WILL BE releasing us and our company from any and ALL liability for your decision to participate. It is only under these conditions that we are willing to share this experience with the public. Aircraft, routes & time aloft may vary with weather, conditions, size & health of the client; and of course, availability.